The J Herbin 1670 fountain pen ink celebrates the life of founder J. Herbin, a French sailor who created inks in Paris in 1700. J Herbin sailed to India collecting ingredients for his inks and wax seals. The J Herbin 1670 fountain pen ink celebrates the 340th anniversary of the companies founding. 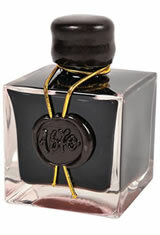 The bottom has a sealing wax on the bottle, reminiscent of the J Herbin wax used for the "grand cru" wines of France. The box displays the life of J. Herbin with a ship, an anchor and a palm tree representing navigation and discovery. Choose from Rouge Hematite in a deep red, Ocean Blue representing the color of the ocean, and Stormy Grey deep coal grey with flecks of gold representing the deep dark ocean. The J Herbin 1670(50ml) Fountain Pen Ink usually ships within 1 business day unless otherwise specified. Each J Herbin 1670(50ml) Fountain Pen Ink we sell is guaranteed to be genuine, authentic and will arrive brand new & unused! I only have one bottle of the 1670 ink (Emerald of Chivor), but I love it so much. It is such a pretty ink. It's a bit of a hassle trying to keep the shimmer mixed in, but it is totally worth the time. It's beautiful. I bought Emerald of Chivor. Oh baby, this is a beautiful ink. Make sure to shake the bottle before filling, and then frequently “stir” your pen to keep the gold particles in suspension. But man, this ink shimmers, sparkles, sheens, shades, and just looks really good. It’s a beautiful teal with a red sheen and gold dust. It honestly looks incredible. Only downside is the price, and the bottle. The neck on the bottle is very narrow, meaning only very specific pens will fit into it for filling. Your best bet is going to be eyedropper filling, dip pens, and filling a converter directly without the nib attached. The J. Herbin 1670 inks are a real treat. I have only used Emerald of Chivor and Stormy Grey, and both are stunning in their own ways, but EoC takes the cake. When writing with EoC, it is quite clear why it is so popular. It is a beautiful teal with an incredible red sheen and gold sparkles to boot. I would recommend any of these inks for something special to your collection. It also helps that they are beautifully bottled. Gorgeous, deep aqua and glitter! Need I say more? This J.Herbin Emerald de Chivor ink is full of shimmery silvery nano particles that deliver such an incredible shiny sheen to my writing. The aquamarine teal-y hue definitely delivers fine shade variations in addition to the sheen, sometimes pooling so dark, it's like being in the depths of the emerald mines which lends its name to this ink. I do find the dry time to be a little long, though expected. Despite the glitter being so very prolific, I haven't had any problems with clogging in the fountain pens I've tried it in. But I have intentionally chosen pens which are wet writing with at least a medium sized nib. If used with a fine nib, I'm not sure how well the shimmery aspect of the ink will be noticeable. And inside the box, there's a little booklet which, in addition to giving a little glimpse at J.Herbin's history regarding emeralds and the Chivor mines, tells you not to leave the highly saturated ink in a fountain pen for too many days. So I made sure to only put the ink in pens that I am able to disassemble completely. And all has been well. Let's see, what else? Oh yes, packaging. As part of the 1670 line, J.Herbin has chosen some special packaging, where the textured cardstock box has its own ink specific artwork. The little square bottle is truly special, featuring a color matched 1670 wax seal on the front and over the cap, signifying which color ink is in the bottle. So yeah, buy this special occasion ink and get writing! You're sure to find many more special occasions with which to use this ink if you had it. Choose your words wisely because words are powerful and your word deserves to be heard. The ocean blue is a little dark for my taste, but the red is gorgeous. How do you review an ink made by a company that's been making ink for nearly 350 years? The anniversary inks are a little pricey but they have these magical properties. Really, they do! If you've read any of the reviews out there, you should know about these. Trust me, those magical properties will only be revealed when writing on a fine quality, fountain pen friendly, paper. I recommend Tomoe River paper from Japan. All of them have very fine "gold" dust in them. (What's a magical property without gold dust?) They are beautifully bottled with coordinating wax seals and wax dipped, screw on, lids. I also recommend that you get one of J Herbin's glass dip pens for use with these inks. (They even kinda resemble a small glass magic wand!) These are not your everyday inks for use in your daily user pen, so get a great dip pen and have some fun making the magic that these inks will make in writing a special note to someone special. I also hope that Pen Chalet will be around for another 350 years or so. If you love shimmer, you'll love this ink. It's a dark, true blue with gold shimmer swimming throughout. You definitely need to shake the bottle right before filling in order to get that shimmer in your pen. To really see the shimmer, I'd recommend at least an M nib. If you don't shake it up, you've just got a nice blue for any need, including professional. It's kind of like a two-for-one; shimmer when you want it, plain when you don't. The bottle is aesthetically pleasing and sits firmly while filling (no odd shape with an awkward center of gravity). I like the look of it just sitting on my desk. I really love this ink! One of my all-time favorite inks. Fantastic dark teal color, dramatic red sheen, incredibly smooth to write with, dries fairly quickly. I like the gold shimmer very much, but it would be a spectacular even without it. When discussing J. Herbin inks it's necessary to consider the history of excellence and the variety of ink colors they offer. This special anniversary edition is in limited colors, but with an exquisite bottle that is immediately collectable. I've given a 4 for functionality since this ink should not be left in a fountain pen long term. If you're a collector and or using an expensive pen, don't learn the "Penman" lesson.